Mother Cabrini Shrine in Golden is a place people visit when they’re looking for comfort. They leave with a feeling that they’re loved and that God is indeed present in their lives. What was originally a camp for orphan girls on Lookout Mountain has become a must-see stop for visitors to Denver and a place Coloradans proudly call their own. 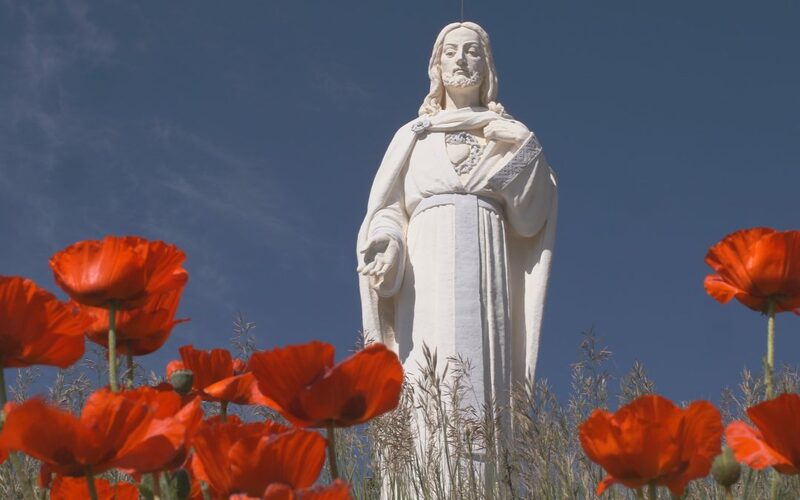 The Shrine is dedicated to its founder Saint Frances Xavier Cabrini and the Sacred Heart of Jesus, a statue of which sits majestically at the top of the property. Saint Frances Xavier Cabrini is the first American Citizen Saint. She was raised in Northern Italy and is the Patron Saint of Immigrants. She originally moved to New York with the Missionary Sisters of the Sacred Heart of Jesus but then, was called to Colorado which quickly became her home that she loved. In June of 2018, Mother Cabrini shrine honored a fellow Italian at its annual gala. Andrea first visited Mother Cabrini Shrine with “a few pennies in his pocket” when he was struggling financially to open his first restaurant in Denver, Il Posto. Andrea struck up a conversation with one of the sisters, who is also Italian, and she promised he would be prayed for that night. The next two days, two friends called out of the blue to offer him the money he needed to open Il Posto. Andrea’s business has taken off over the last ten years and he is outspoken about his gratitude for the gifts he has received through Mother Cabrini Shrine. Aside from owning Il Posto in Denver’s RiNo neighborhood, he also owns three Vero Restaurants which specializes in his family’s Northern Italian pizza recipes. “All of this stuff come to me through Cabrini Shrine and I have an amazing responsibility to do something with it,” Andrea said. Among other things, Andrea closes his restaurant down once a year for a fundraiser for Mother Cabrini Shrine and serves close to 100 people. “I can’t explain how special this place is to me,” Andrea said. Andrea is the recipient of the 2018 Company for Cabrini Award for his support of the mission of the shrine and the Missionary Sisters. Also in June 2018, Mother Cabrini Shrine recognized a Denver area couple who are longtime supporters. Margaret and John Kelly were honored with the prestigious Spirit of Cabrini award. They first visited Mother Cabrini Shrine as newlyweds and continues to visit weekly for Sunday Mass as they grew their family. Margaret and John are now retired from their careers and are focusing their lives now on helping others through Catholic related charities, like Mother Cabrini Shrine. “The Kelly’s give wonderful financial contributions to Mother Cabrini Shrine but they also jump right in and help out with whatever is needed, like helping us with the Seven Last Words of Jesus service on Good Friday, sharing their faith and speaking in front of others,” Mother Cabrini Shrine Administrator Jeff Lewis said. Mother Cabrini Shrine is open every day in the year, weather permitting. Mother Cabrini Shrine hosts retreats and celebrates daily and Sunday Masses. Each Sunday afternoon, there is also a Spanish language mass in the chapel which is packed. That is what Saint Frances Xavier Cabrini wanted. Mother Cabrini moved to Denver to help orphan girls at Queen of Heaven Orphanage in Denver, CO. She would also travel to mining communities across Colorado to meet with Italian mine workers and their families. She always admired the Rocky Mountains and in 1910, she purchased several hundred acres on Lookout Mountain from the city of Golden. She along with her fellow Missionary Sisters of the Sacred Heart of Jesus created a summer camp for the girls in their Denver orphanage. Although beautiful, this property was dry. The sisters would have to go off-property to a spring to collect water for eating and drinking. Although obedient to Mother Cabrini, the sisters complained about the inconvenience. One day in September of 1912, Mother Cabrini pointed to a rock and encouraged the sisters to dig in that spot and assured them that they would find water. And they did! A beautiful, sacred grotto stands next to the fountains, containing that special water. It is in this small, candlelight grotto where people pray to Mother Cabrini and ask for her intercession in their lives. That is the impression Mother Cabrini would want visitors to have. She would also be proud to see visitors climb 373 steps to see the very large statue of the Sacred Heart of Jesus, which is visible to travelers on I-70 below the property. The Stairway of Prayer is the same route that Mother Cabrini would climb with the orphans during the summer camp. At the top of the steps, right in front of the large statue of Jesus, is a collection of rocks in the shape of the Sacred Heart that Mother Cabrini put together. I spoke with first time visitor Maureen Shaw who admits she was always curious about Mother Cabrini Shrine and felt something special when she arrived. I personally agree. This project was very special to me. I had spent time at Mother Cabrini Shrine before and during those visits, I did indeed feel a very special connection to God and the exceptional Saint Frances Xavier Cabrini. However, this storytelling was profound for me because I got to listen to the stories of other people and hear how the Shrine impacts their lives. We wanted to share the story of Mother Cabrini Shrine in Spanish because it has many visitors who are Spanish-speaking. This story rotates along with the English-language story in the shrine’s gift shop and museum. Please provide a brief description of your story, what your needs are, and if you have any questions for me, feel free to inquire!